I thought I'd give this a go as it sounded fun. Looks a lot like [Garry's ?] the 'Little Gem' but obviously not as cool as that. It only cost me ?2.99 in parts plus a few bits I had knocking around the house. It vapes similarly to my Janty Stick, probably 'cos I'm using its 801 atty & battery lol. It also works with 3 AAA's but I don't know how long they will last at this time. So anyway, thanks for the inspiration guys. Brian. Nice one brian...ummm I think you could replace that holder for the 3 AAA's if you wanted with and 18500 battery...give it a quick measure 18 mm in diameter, 50 mm in length? 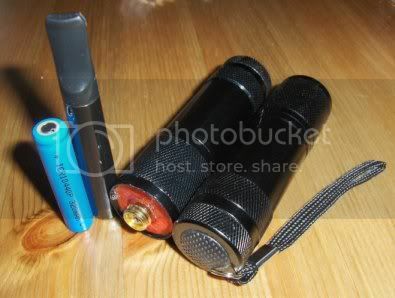 I have a very similar flashlight thats what I been using in it. I also use a piece of schedule 40 PVC pipe as a sleeve and can use a 14500 in it as well. Hi Dereck. Yep 18mm diameter & 50mm long. Thanks for the tip which is good timing as I've recently received a LF charger that would work with the 18500. Got any photo's of your flashlight mod bychance? Would be great to see it. Brian. Well done, looks good. I've never got around to doing anything with one yet, but I will. You suprise me Diane and it even takes batteries. Lol. I'm making a special one just for you Billy it's wired to the mains, lol. Beldar rocks Dereck! lol. I modified the existing switch so that it only stays on when pressed. It was just a matter of snipping off the four little cogs on the centre white plastic to stop it from locking on. The atty end was even cornier. I have a hole cutting drill bit that just happens to have an 8mm diameter centre drill and the smallest hole it makes just happened to be the right size to fit in place of the lens & bulbs. A couple of wires in the battery enclosure so that only one 10440 makes the circuit. In theory I could get a 7.2V vape with a high voltage atty but have not tried it. I am more than happy vaping at 3.6V for now. I picked up another mini flashlight for 99 pence the other weekend. Its v small so there's not much room for switches. Its going to be a work in progress I think. Diane, if you wanted to try this torch mod I am happy to help. Got a pound land near to you? Brian. Nice to see you have a good sense of humour. Lol. Thanks, I've got a poundland in town Brian, depending on sick kids I might manage to get down there this week. What do I need to get. I've also got a lot bits and bobs around the house I could probably use. I'd go mad if I never had a sense of humour Billy, I go around like a stupid cheshire cat even when my world crumbles around me, lol. All you really need from there is the torch they sell that looks the same as the one in the pic at the top of this post. It has a "rubber end" [easy now Billy! lol] that is the on/off press switch and the other end houses about 9 led's. Oh, don't forget to ask the cashier how much it is when you're paying for it. They love that one in poundland! You might also want to order your preferred type of atomiser battery connector that was talked about in your neighbouring thread. When I eventually find time I'm going to have a go at making one, so may come back to you all for help. Thanks Brian! and Beldar thanks you as well lol! I wasnt so lucky as the bottom button on mine was the opposite...If I cut those notches it would keep the circuit closed and remain permanently activated...I can use a 6mm tactile switch on the next one though (thanks to Mikrosoft on another forum for showing me that)...I was just in a rush to grab parts to get first done. I think I have the same hole attachment for my drill...I'm gonna try printed cicuit board material to do the top its copper coated strong and easy to cut and sand...I guess you wouldn't even need to run a ground wire off the atty connector if you used that for the top, no? I'd probably take a second to sand the paint off the inner edge of the flashlight/torch where I was gonna press the top into maybe do a few small beads of solder where it meets before epoxying it into place. Anxiously awaiting pics of your next one! Have fun, its pretty cool vaping something you built huh?